I love Sarah Waters’ books. Fingersmith is one of my personal favorites, a Victorian tale of intrigue and missing heirs with exhilarating twists and turns. Stephen King put The Little Stranger on his list in EW of his favorite books for last year, and his description made me want to read it immediately. But I couldn’t find it in B&N. It must be in that weird time, when a book has been out in hardback too long to be readily stocked, but it’s not in paperback yet. I tried getting it from the library, but the line for holds was so long it would be June before I got to read it. In the meantime, I read Waters’ The Night Watch, which was beautiful, so elegantly written, and sad. But that’s another post. I finally broke down and ordered the British paperback from The Book Depository , a brilliant site for getting British books at American prices with no shipping charges. I was prepared to devour this book, to love it. The story is set in post-war England, told by a doctor in a rural town. He is called upon to treat a member of the local gentry, in the house where his mother was once a servant. The Ayres have lived in the grand Georgian house Hundreds Hall for centuries, but have fallen on hard times and are barely getting by, with their house crumbling around them. Dr. Faraday becomes a friend of the family, and is witness to the strange and worrying events that begin to befall them. The son, Roderick, tells him of seeing objects move in his room, and that he feels there is a Presence in the house that means them harm. Faraday puts it down to nerves, and helps have Roderick committed after his room catches fire. Even though the fire seems to have started in multiple places, Faraday believes Roderick responsible. Then other things start happening. The daughter, Caroline, is plagued by late night phone calls. The bells in the house begin ringing for servants when no one is in the room. An old speaking tube starts making noises. Is there a Presence in the house, or can it all be explained rationally? Faraday and his fellow doctors are disbelievers, but the Ayres family and their servants know there is Something in Hundreds that means them harm. I liked it a lot, but I didn’t love it like I thought I would. I have a weakness for English Country House stories of any kind, and the blurbs warning of needing to sleep with the light on after reading it made me think I was in for a good scare. Actually they had me worried I’d picked a bad “read before bed” book. It’s not scary, though, more eerie and unsettling. I slept fine, with the lights off. Its substory of the downfall of the landed gentry in postwar England is the more interesting and poignant. The Ayres are a good family, and want to keep their home and farm functioning in a world that no longer needs them. In a more rested state I could go on about the metaphors of the decaying house and the decay of the strict class system, but I’ll spare you as I’m too tired to write it well. Waters doesn’t hammer it home blatantly; she simply writes the story and leaves the reader to make the connections or not. Subtlety is rare in books about the class system, and greatly welcome. Waters shows affection for the Ayres, even in their obliviousness to the lives their servants must have led. They’re not bad people, they’re outdated and unable to adjust to a new regime. The ghost story is creepy. Thinking about living through such events could easily keep you up at night. But by having Faraday narrate the book, we’re kept at a cynical distance to the events, and they don’t resonate as strongly. Faraday can’t decide if he believes, so in a way, the book can’t either. January 30, 2010. Tags: Books. Books. January 30, 2010 at 7:01 pm. Permalink. May 26, 2010 at 12:32 pm. Permalink. 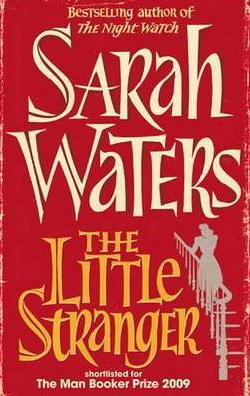 Get “Little Stranger” from the library. It’s good, but it’s not one I’ll read over and over. “The Likeness” by Tara French is simply one of my favorite books ever, and it creates this Irish summer feeling while you’re reading it, so it’s good for this time of year. And the Cornelia Read books are new favorites. Her writing is whip smart, funny, and she has some real insight into the effect of old money families on society. Start with her first one, “Field of Darkness”. Her newest one, “Invisible Boy,” would interest you as a lawyer, being about how the system lets down those who need it most. But start with “Field,” and fall for Maddy Dare. So glad to see you here!!! May 26, 2010 at 2:47 pm. Permalink. Enter your email address to subscribe to Mockingbird and get notice of new posts. ‘tude can create a kind of invisible, protective barrier. Like rap music or that bubble car the Pope drives around in."